Nicholas doesn't usually get cafeteria food for breakfast or lunch so, of course, he thinks of it as a treat to go through the cafeteria line. 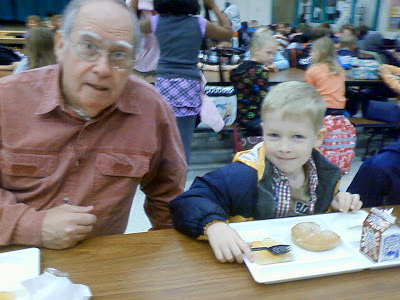 Since Granddad's flight home was this morning we let Nicholas have breakfast in the school's cafeteria with Granddad. 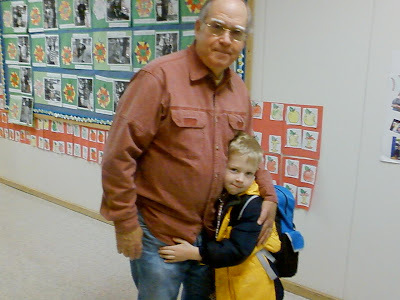 Then Granddad got to walk him to his classroom and get one last hug before leaving for the airport. But as Rachel and I were on our way to take Granddad to catch his flight, he got a call informing him that his flight had been cancelled due to bad weather between here and home. He got rescheduled for a flight tomorrow morning. Woo hoo! We get Granddad for one more day! This is the second time poor Granddad has gotten stuck here because of bad weather. The other time was back when we lived in Arlington and his flight got cancelled because of Hurricane George. After Nicholas got out of school, we spent some time at a toy store. 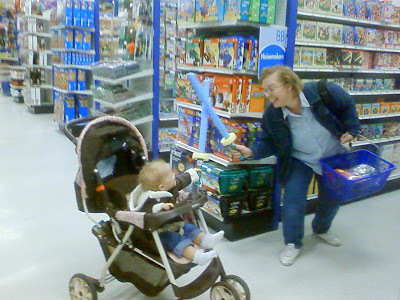 Nicholas had fun sword fighting with me with some soft foam swords that he found. He even gave one to Rachel who surprisingly knew how to handle a sword and did quite well with it. I guess that's what happens when you grow up with a big brother. My Dad took this picture of me playing with Rachel. It is special to me because right after he took it he said in such a sweet tone that it was neat to watch me play with the kids like that because it reminded him of mom playing with my brother and me when we were little. That means a lot to me.